3 October 2017, New Delhi: Since its implementation, GST has regularly been called a game changer for the Indian economy and businesses. After the initial hick ups, things were looking to be on-track but the latest surveys conducted by LocalCircles among SMEs, traders and start-ups has revealed some pain points that GST has generated for them. The survey received more than 17,000 votes. 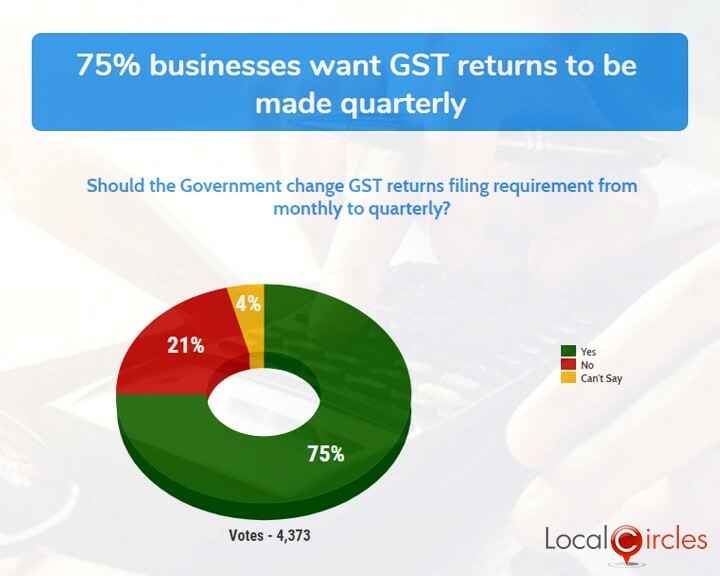 The first poll asked entrepreneurs if the government should change GST return filing requirement from monthly to quarterly. 75% responded in an affirmative while 21% responded in a negative. 4% were not sure about it. Filing GST returns every month is a time-consuming exercise which needs the business owners to ignore their daily work routine and dedicate resources towards this exercise causing loss of time and decline in revenue. The second poll asked if the government should consider proving a 6-month freeze/deferral on penalties for filing late GST returns and 79% respondents agreed with it.17% did not agree with it and 4% chose not to answer. The next poll asked if the daily exemption limit for expenses incurred with unregistered vendors be increased from the current Rs. 5,000 to Rs. 10,000. 69% responded saying it should be done while 22% said it should not be done. 9% were unsure about it. 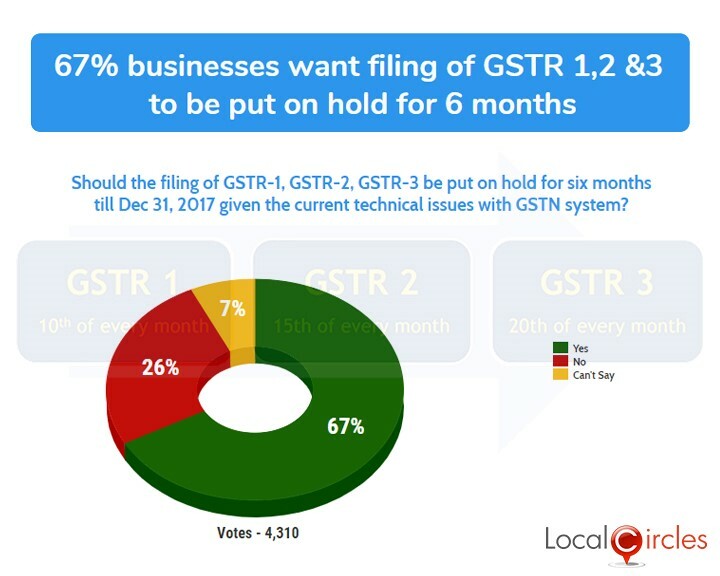 The last poll asked if given the technical issues with the GSTN system, should the filing of GSTR 1,2 and 3 be put on hold for the next six months. 67% responded in its favour while 26% voted against it. 7% chose not to answer. 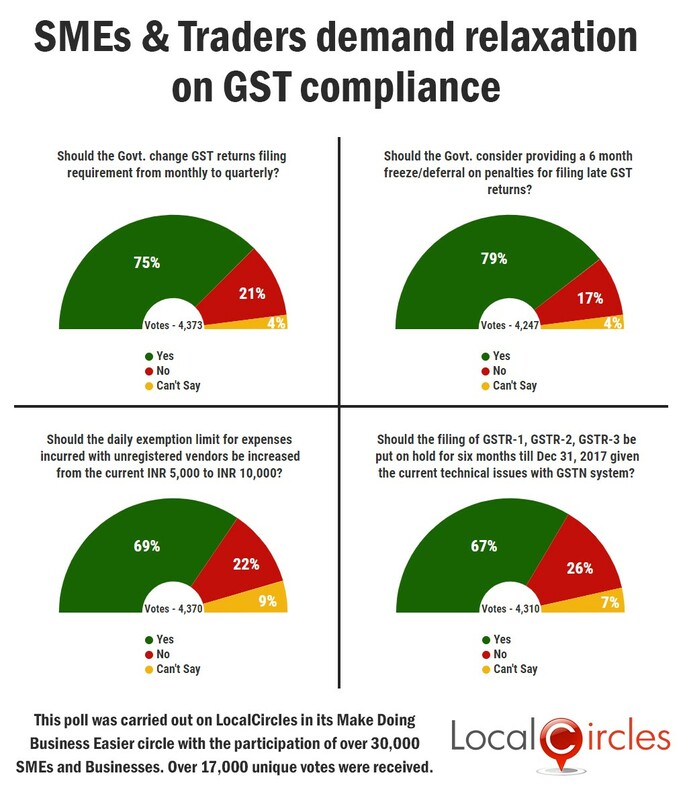 Many structured discussions have also taken place on LocalCircles in the last 2 months since the launch of GST. Some suggestions that came up included marking the lower of the two MRP (pre and post GST) on the old stock, the rule requiring a e-way bill to transport goods across state borders to be relaxed and Reverse Charge Mechanism under GST to be eased out in case business is done with SMEs and small traders. All services to startups have been brought under GST which has increase the costs for startups by about 20%. Startups also requested this rule to be reviewed as it is putting a lot of strain on their finances. In a relief to businesses, Department of Consumer Affairs has already accepted one of the demands of SMEs and traders where they had requested the date to sell old/pre-GST stock to be extended to 31st December 2017. 79% small businesses had voted in its favour in a LocalCircles poll last week and the department had issued a notification about the same on 29th September 2017.